Aircraft able to transport all ground units. Balloons are air transport units which can load other ground units into them (up to 2 units per balloon) and transport them over long distances. They're available to recruit from a Tower. Balloon Cherrystone Kingdom Cherrystone Balloons are woven from a silk produced by silkworms found on the western edge of the Gloomwoods. Powered by a particularly potent Alchemist's brew, they are capable of transporting heavy cargo and staying aloft almost indefinitely. 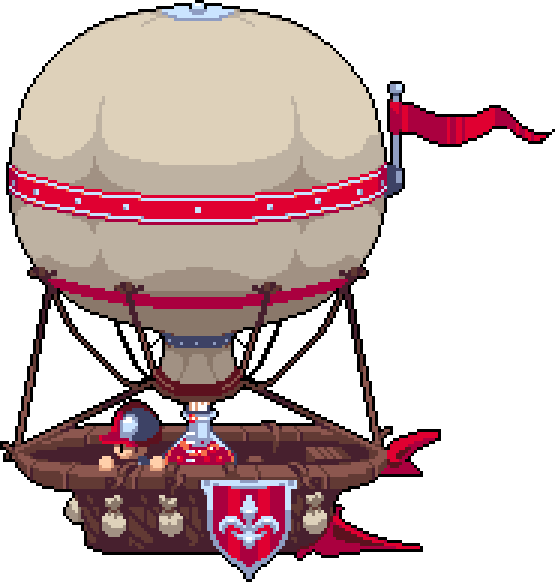 Once in a while, the Balloon's pilot will add iron fillings to the brew to ensure it continues to bubble. No one questions why this works for fear it may stop. Balloon Felheim Legion The concoction used to fuel Felheim's Balloons is a foul substance derived from Fellbat droppings. With the wind behind them, they travel quickly, but their location is often given away by their overpowering odour. Should a Balloon burst, the resulting stench cloud has been known to kill nearby plant life. Balloon Heavensong Empire Though not particularly hi-tech, a convoy of Heavensong Balloons is a beautiful sight to behold. Each Balloon is constructed like a paper lantern, and glows as it flies. civilian balloons, coloured and decorated, are a common sight in the night sky during festivals and celebrations. Floaty Thing Floran Tribes It is powered by a plant found on the bed of the River Bani. When prodded, this plant releases a jet of hydrogen gas to scare off would-be predators. A Floran pilot's primary role is to regularly prod the plant mounted in the Floaty Thing's gondola with a nice, sharp stick. This page was last modified on 11 March 2019, at 08:48.